Thursday July 28th 1921 I feel very much better. I was down at Fannies a few moments. The folks went on an errand to Tipton. I had an interesting letter from Laura and Lydia. It began to rain about noon. The folks home at 3.30. Wrote to Mrs Pickens and Lydia. The evening at home on porch. 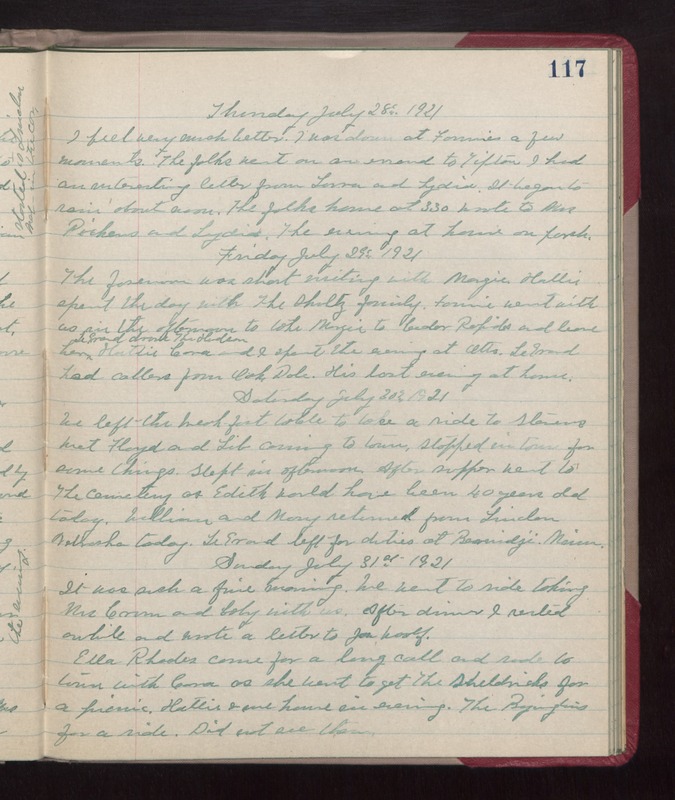 Friday July 29th 1921 The forenoon was short visiting with Margie. Hattie spent the day with The Shultz family. Fannie went with us in the afternoon to take Margie to Cedar Rapids and leave her. LeGrand drove The Hudson. Hattie, Cora, and I spent the evening at Otts. LeGrand had callers from Oak Dale. His last evening at home. Saturday July 30th 1921 We left the breakfast table to take a ride to Stevens. Met Floyd and Lib coming to town. Stopped in town for some things. Slept in afternoon. After supper went to The Cemetery as Edith would have been 40 years old today. William and Mary returned from Lincoln Nebraska today. LeGrand left for duties at Bemidji, Minn. Sunday July 31st 1921 It was such a fine morning. We went to ride taking Mrs Crum and baby with us. After dinner I rested awhile and wrote a letter to Joe Woolf. Ella Rhodes came for a long all and rode to town with Cora as she went to get The Sheldricks for a picnic. Hattie & me home in evening. The Byingtons for a ride. Did not see them.